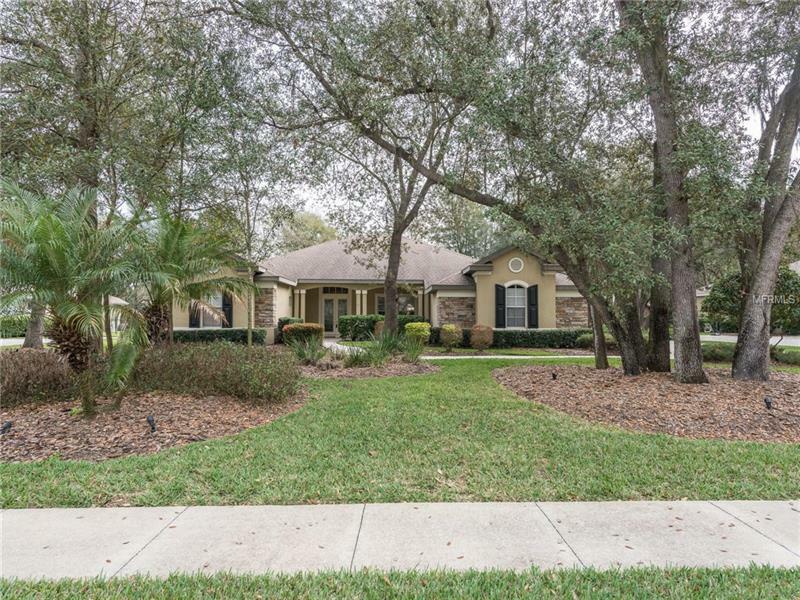 PRIDE OF OWNERSHIP SHOWS IN THIS 4 BEDROOM 3.5 BATH HOME IN THE PRESTIGIOUS GUARD/GATED COMMUNITY OF FISHHAWK TRAILS. THE KITCHEN FEATURES LOTS OF CABINETS WITH UNDER COUNTER LIGHTING, TILED BACKSPLASH AND PENDANT LIGHTING ABOVE THE BAR AREA. THE BREAKFAST NOOK OVERLOOKS THE POOL AND OFFERS A BUILT IN DESK AND FRENCH DOORS THAT LEAD TO THE LANAI. THE OPEN FAMILY ROOM BOASTS A GAS BURNING FIREPLACE AND A CUSTOM BUILT IN ENTERTAINMENT CENTER. THE FORMAL LIVING ROOM HAS FRENCH DOORS OPENING TO THE POOL. THE FORMAL DINING ROOM OFFERS A COFFERED CEILING. THE FOYER OFFERS ART NICHES AND A COFFERED CEILING. THE SPACIOUS DEN/OFFICE HAS FRENCH DOORS. THERE LARGE MASTER SUITE OFFERS PLENTY OF ROOM AND FRENCH DOORS THAT OPEN TO THE LANAI. THE MASTER BATH FEATURES A GARDEN TUB, A LARGE WALK IN SHOWER, WALK IN HIS & HER CLOSETS AND HIS & HER VANITIES. THERE IS A ROOM OFF OF THE MASTER BATH THAT IS PERFECT FOR A WORK OUT ROOM OR YOUR PRIVATE OFFICE. THE SECONDARY BEDROOMS ARE SPACIOUS, TWO OFFERING A JACK N JILL BATHROOM. THE LARGE BONUS ROOM IS LOCATED IN THE BACK OF THE HOUSE. CROWN MOULDING THROUGHOUT THE HOUSE. BEAUTIFUL WOOD FLOORING IN THE FOYER, LIVING ROOM, DINING ROOM AND KITCHEN. THIS HOUSE IS PERFECT FOR ENTERTAINING WITH THE LARGE POOL AND SPA SURROUNDED BY A BEAUTIFUL BRICK PAVED LANAI AND THE CUSTOM OUTDOOR KITCHEN. THE GARAGE OFFERS EPOXY FLOORING AND FLOOR TO CEILING CABINETS. THERE IS A WELL FOR THE IRRIGATION SYSTEM. THIS HOUSE IS SITUATED ON A TREE SHADED 1/2 ACRE LOT.